Nazan Öncel was born in İzmir, Karşıyaka, on the second wedding anniversary of a mother who was a teacher and a father who was a government officer. She encountered the camera in 1961, performing for the first and the last time as a child star in the movie Sad Coincidence. While inheriting the knack for literature from her father Muzaffer; learning the musical notes from her mother Raziye at the age of six helped her greatly in playing the guitar and singing in her middle school years. When attending middle school, she was invited by the Prime Minister to Zafer Primary School, where she graduated, to perform at the end-of-term celebrations, and she played the mandolin dressed in the outfit her mom specially made for her, instead of the black school uniform. 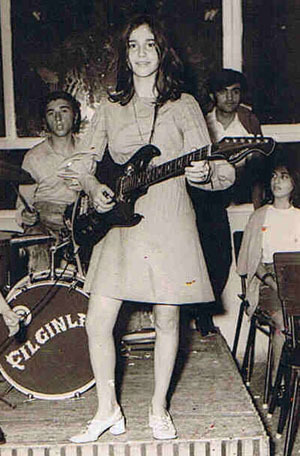 As she gained her initial stage experience in her three-year of performance with the Kervanlar Orchestra, she performed as a singer at wedding halls and festivals with the band "The Crazy" that she started in 1971 at the age of 15. In 1975, her own song "My Mother" was the winner of a song contest organized by the Official Radio of Izmir. Come 1978, she recorded her first 45" record in Istanbul. The song called "I Was Your Slave and Mistress" (lyrics by Erdener Koyutürk, music by Özdener Koyutürk) gained much popularity on TV and the radio. She was now more frequently on TV and the press praised her. In those days, her first Long Play, "Prayer for Rain" was released in the transition period from pop music to the reign of pianist-singers in 1982. In this record, alongside the popular arabesque and a la turca songs of the time, she included her original songs were as well. Performing in various hotels and clubhouses throughout the 80s, Öncel shed the beginner's feel of the first record, and also made headway on the path to writing her own songs. Nazan Öncel's first album "There is Something Going On" comprising completely of songs of her own was released in 1992 when pop music was getting more and more popular in Turkey. In a snowy winter day, she wrote a song called "Don't Leave, Stay in This Town" in her basement apartment at Kurtuluş. Here is the song that gives us the blues, that we figure is going to get us addicted. With "Fixed Chorus", we all recognize her sense of humor, singing it's half life and half stale (a rhyme is present in the words hayat and bayat, meaning life and stale). There is really "something going on", and Nazan Öncel is what it's called. As songs like "Fixed Chorus", "Don't leave, stay in this town", "I'm not in love but I may fall", "Dot dot dot", and "Leylim Yar" joined in the pop music classics of the 90s, popular music has been introduced for the first time to an important composer who has formulated a language of her own. Later on in 1994, when the singer/composer released the album "I haven't seen a love quite like this", she won the hearts of her audience all over again with songs like "Love doesn't wait" (I will spread flans), "Nights are black wagons", "I haven't seen a love quite like this", "You and I will be gossiped of", while her song "I will spread flans" was regarded as the first anonymous pop song in Turkey by radio show hosts. "Exodus", an unplugged folk-rock album released in 1995, has nominated Nazan Oncel as the representative of a "songsmith" tradition, taking her somewhat away from the world of pop music. "Let's get out of here", "You are killing me", "Pick a song", "My infant heart", and, last but not least, "Exodus" have become the most cherished tracks of the album with the lyrical and plain structure in the lyrics. Reaching out as far as the Czech Republic chiming pleasantly in Czech radios, "Exodus" has us experience our unique beauty. It is the album that has been named unique in this piece of land. And it has been picked by its audience as one of the three things you take on adeserted island along. "Exodus" is now the album of deserted islands. Released in 1996, "Street Girl" was a rock album where electro guitar and electro baglama (an instrument with three strings) played lead roles. From this album on, she became our Street Girl, and she was the musician who introduced baglama to the new generations after so many years. The success of the tracks "Men yearn too", "Let me love and be at ease", "I'm a street girl" and "Oh, this life" recharged the confidence of producers in rock music, paving the way for new generation rock musicians. The 1999 album "Steel Nut" claimed attention with videos of the tracks "Lovers Park", "Can't go in this weather", "Tough world", while the tracks "F**k your politics" and "Steel nut" attracted the reaction of the conservative side of the media. It was interpreted as the sharpest, bravest album of all times, lifting the country over a certain threshold. It was an exception when she recorded the track titled "Mahur", a product of Attila İlhan / Ahmet Kaya, in a tribute album to Ahmet Kaya in 2003 titled "Listen Dear Country". "Let's have our picture taken side by side" was one of the most loved albums in Turkey in 2004. "Hay Hay", "Where to", "Hokka", "Rose Pension", "Smartass" and "Automobile" were the favorite tracks of radio shows, while she took home many awards up until today and lifted her musician friends up the charts with the songs she gave them. Especially "Of Of", 'Hüp' and 'Dudu' were met with great enthusiasm in Europe, the Middle East and Russia. She performed four songs from her album "Let's have our picture taken side by side" in the movie directed by Kutluğ Ataman, Two Young Girls. One of these tracks, "Life is actually beautiful" has strongly reflected the feeling of sobriety that a song contributes to the art of cinema. The original versions of "Exodus, Street Girl and Steel Nut" were re-introduced to her fans in 2005 in the album "Pick a song", even though she says that she "only did [her] job", she really did a big favor to her fans by releasing a bedside album, granting it the deserved place among the most loved albums. When she crossed paths with Avrupa Records in 2006, she greeted her fans with an album titled "You ate me up", the track titled "My love, look at me" entered charts from number one the first day it was played on radio channels, staying number one for 8 weeks, earning the title of "the most clicked on and downloaded song", becoming a Nazan classic together with "Cry on my shoulder" and "You ate me up". In support of musician Hamit Ündaş, she was the producer of his 2008 album Janti, contributing with two duets, "I won't let you go" and "Keep crying". "I kept silent for your sake", which is the first album of 2009 has two great surprises: Her own composition titled "My dear how are you", which was given as a gift to Orhan Pamuk's most recent masterpiece, the Museum of Innocence; and "I have to see you today", which was accompanied by Vic Chessnut, a musician who played and sang with many bands and performers such as R.E.M, Madonna, Garbage, and Smashing Pumpkins I kept silent for your sake, an album by a songwriter, performer and musician who kept writing her songs such as Steel Nut and Leyla, that are brave, right-minded and that break taboos, encourages its audience to face life through a strong repertoire and arrangements that come off like a heavy novel. You may listen to this album of hers, whose cover with a zipper on her mouth symbolizes the voice of unspeaking, mute societies, either with your eyes closed, or dancing with your lover.